The Plantronics HW261N SupraPlus Wideband Binaural Headset has been discontinued. No direct replacement is available. 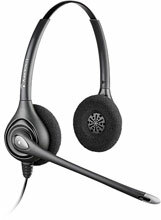 SupraPlus wideband binaural over-the-head style noice-cancelling headset for Cisco phones, features quick disconnect. SupraPlus wideband binaural over-the-head style noice-cancelling headset, requires a Plantronics amplifier.